It’s all about great writing and storytelling. Those are the words on the wall at Mohawk College’s journalism lab and Kurt Muller’s guiding philosophy. Muller, who was named Associate Dean of Media and Entertainment last spring, leads a team of faculty and staff who help Mohawk students develop storytelling skills for our digital age. Under Muller’s watch are a wide assortment of programs: broadcasting - television and communications media, broadcasting - radio, journalism, creative photography, graphic design, art and design foundations, pre-media, integrated animation and music. It’s been a steep learning curve but Muller, a former journalist, says the students and his colleagues invigorate him. During Muller’s previous post as academic coordinator of the journalism program, he and the faculty revamped the curriculum to build an emphasis on digital storytelling, multimedia content and the convergence of broadcast, print and online journalism. There is also an emphasis on providing the best professional software and making students comfortable with technology. But no matter the technology, Muller’s motto remains that it’s all about the storytelling. The program has achieved the highest student satisfaction ratings in the province among similar journalism programs over the last two years and earned a Broadcast Educators Association of Canada award for best student newscast in 2011. Muller has made it a priority to make Mohawk’s journalism program more welcoming to a broader range of applicants. An accessibility project was awarded an $80,000 grant last summer from the Broadcasting Accessibility Fund, which is dedicated to making broadcast content more accessible to people with disabilities. The goal is to develop another layer of skills to journalism students but also make Mohawk a program of choice for those with disabilities. The college’s newsroom is being renovated to accommodate those with physical disabilities and software is being added to allow for dictation, closed captioning and screen reader accessibility. Muller and faculty in the journalism program have worked with Mohawk’s Accessible Learning Services to develop course curriculum and to offer a core journalism course this September. They’re also receiving guidance from an advisory board that includes former Lieutenant Governor of Ontario David Onley, and other groups representing Canadians with disabilities. The plan is to also develop a post-graduate certificate in accessibility. The skills will be in great demand when the Accessibility for Ontarians with Disabilities Act comes into full force. Muller, who was born in South Africa and grew up in Burlington, got a BA in English literature before heading to Sheridan College to study print journalism. He started his career as a general assignment reporter for the Opasquia Times in The Pas, Manitoba before returning to The University of Western Ontario to get a masters degree in journalism in 1993. He discovered a love for the shooting and editing involved in TV journalism and took a job with a CTV station in Windsor after graduation. From there, he became a reporter for CFTO News and then a writer for CTV News with Lloyd Robertson. 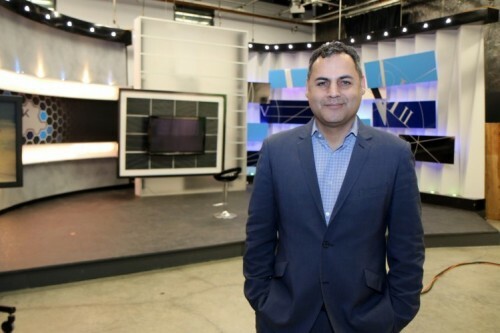 He went on stints as a writer and producer for the broadcaster’s website and then took over the transportation beat for CTV News. Among his most memorable assignments over the years was taking a ride with the Snowbirds and flying the plane for a few seconds. He also profiled the scientist who developed the DNA extraction technique that exonerated Guy Paul Morin. His last post before coming to Mohawk full-time in 2004 was news writer for CTV Newsnet. He started teaching part-time at Humber College before joining Mohawk. “Teaching to me is one of the most rewarding things I’ve ever done in my career. I love teaching students to tell stories and explore the world. Seeing students get it is so gratifying,” said Muller. Muller, a founding member of the Hamilton Independent Media Awards, acknowledges parts of the media sector have seen their employment levels shrink.